The Sumerians were among the first astronomers, mapping the stars into sets of constellations, many of which survived in the zodiac and were also recognized by the ancient Greeks. They were also aware of the five planets that are visible to the naked eye. In the 6th century B.C. the scribes of Enuma Anu Enlil were a group of men at the Babylonian court who were experts in astronomy and astrology. Texts refer to this group of scribes, but we do not know exactly who they were, what they did and how they were trained. However, for hundreds of years the scribes kept accurate records of natural events on the earth and in the sky in order to predict the future. Sumerian astronomy was primitive compared to later Babylonian standards. 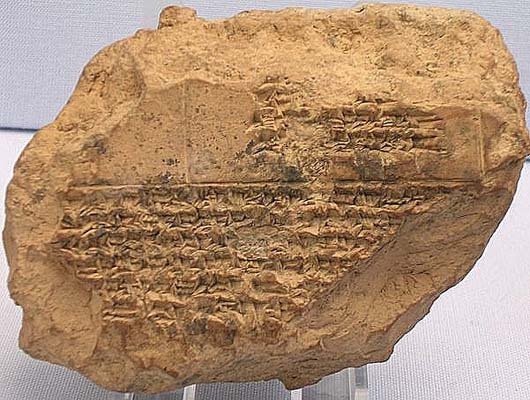 Babylonian clay tablets that have survived since the dawn of civilization in the Mesopotamian region - record the earliest total solar eclipse seen in Ugarit on May 3, 1375 BC. Zodiac - Astronomers recognized and cataloged the brightest stars, outlined a rudimentary set of Zodiacal constellations, and noted the movements of the five visible planets (Mercury, Venus, Mars, Jupiter, and Saturn), as well as the Sun and Moon amongst the stars of the Zodiac. 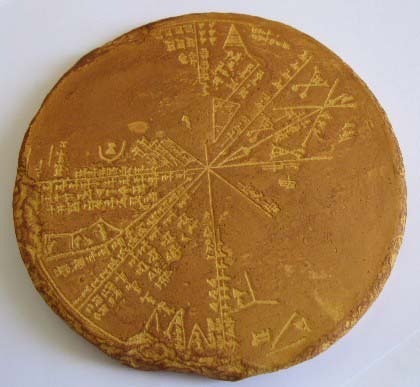 Sumerians also developed a rudimentary system of astrological divination for use in foreseeing the future of city-states and battles, but not for predicting personal futures. The month began at sunset, with the first visible (thinnest) crescent of the New Moon, which is visible about 18 hours after conjunction or about 36 hours after the disappearance of the Old Moon's thinnest crescent, (under certain circumstances this can be as short as 22 to 24 hours after disappearance of the Old Moon, with a clear western horizon). The lunar calendar was synchronized with the solar year (the seasons) by intercalation of a leap month every few years. The Sumerians of Babylon were probably the first people to make a calendar. They used the phases of the moon, counting 12 lunar months as a year. To make up for the difference between this year and the year of the seasons, they inserted an extra month in the calendar about every four years. The early Egyptians, Greeks, and Semitic peoples copied this calendar. Later the Egyptians worked out a calendar that corresponded almost exactly to the seasons. The early Romans also used a calendar based on the moon. The year in this calendar was 355 days long. The months corresponding to March, May, July, and October each had 31 days; February had 28 days; and the rest had 29. An extra month was added about every fourth year. The high priest regulated the calendar. On the calends, or day of the new moon, he announced to the people the times of the nones (first quarter) and ides (full moon) for that month. The word calendar is from the Latin word kalendae. The priests, however, performed their calendar-keeping duties poorly, and by Julius Caesar's time they had summer months coming in the spring. Caesar corrected this situation in 46 in the Julian calendar. 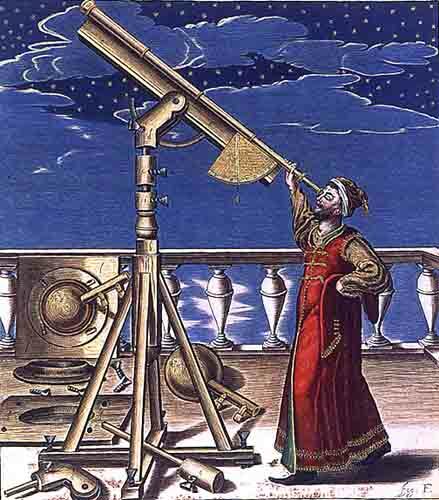 He adopted the plan of the Egyptian astronomer Sosigenes's 365-day year, with one day added every fourth, or leap year. He distributed the extra ten days among the 29-day months, making them identical with the months today. In ancient Sumer there were two "seasons" in the Sumerian year - a "summer" season Emesh which began on the Vernal Equinox - and a "winter" season, Enten, which began on the Autumnal Equinox. New Year's day was an important holiday (when the sacred marriage rite was performed). This was celebrated around the Vernal Equinox, depending on the synchronization of the lunar and solar calendars. The new year and month would begin on the first New Moon, after the completion of the old lunar year. The day began and ended at sunset and contained twelve hours. It is important to note the similarity of the old Sumerian calendar and the Hebrew calendar, including the timing of the Hebrew Passover (around the same time as the Sumerian New Year), and the beginning of the Hebrew Sabbath (at sundown). Julius Caesar's correction of one day in four years - 1/4 day, or six hours, a year - made the calendar year longer than the year of the seasons. Thus anniversaries began coming earlier and earlier in the year. In 1582 the vernal equinox, or beginning of spring, occurred on March 11 instead of the correct date, March 21. Pope Gregory XIII remedied this by directing that ten days be dropped from the calendar and that the day after Oct. 4, 1582, should be October 15. He also directed that three times in every 400 years the leap-year arrangement should be omitted. The new calendar was called the Gregorian, or New Style (N.S. ), calendar. It was adopted by Roman Catholic countries, but Protestant and Eastern Orthodox countries long continued to use the Old Style (O.S. ), or Julian, calendar. The new calendar was not adopted in England until 1752, when it was necessary to drop 11 days. The Eastern Orthodox church accepted the New Style in 1923, when 13 days were "lost." The Chinese had adopted it in 1912. Another reform that the Gregorian calendar affected was general adoption of January 1 as the beginning of the year. Until then some nations began it with December 25, others with January 1 or March 25 - as England did before 1752.